I haven’t struggled so much to come up with a name for a recipe before. Usually I go with the title of the original recipe if it is from some source or pick something which is more apt. 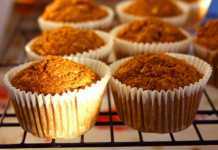 This oat bran muffin recipe is an exception to it because it has a big list of healthy ingredients and leaving even just one doesn’t seem right to me. So you must be wondering what is really there in this muffin! 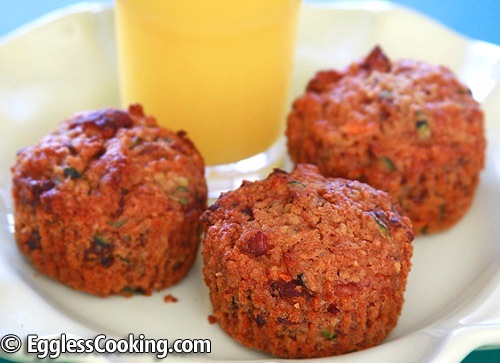 It has significant amount of oat bran, carrots, apples, zucchini, raisins and pecans. I have made it vegan as well. Now you can understand what I’m talking about right? Muffins can’t get any healthier and tastier too. Yes you read it right, these oat bran muffins are damn tasty. You don’t really realize the presence of oat bran because it is loaded with lot of other ingredients. Usually when a recipe calls for a huge quantity of healthy flour like whole wheat or oat bran in this case, we usually try to mask it with a whole lot of other unhealthy ingredients but in the end term it as healthy. But this muffin recipe is a BIG exception to this. It has so much other healthy ingredients going in but it actually doesn’t taste healthy at all. It tastes just like any other ordinary carrot muffin or even better I can say. 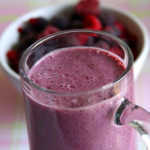 I found this recipe in “250 Best Muffin Recipes” by Esther Brody. I have modified it a little bit to make it vegan and to use the stuff I had in the refrigerator. My son helped me with measuring the ingredients and when I was in doubt myself whether the muffins are going to turn out right, like a big fellow he was assuring me that it is going to be just fine. And it was very fine indeed! These oat bran muffins are good for any time of the day. It can be a very good way to start your day with a cup of milk or freshly squeezed orange juice, or to pack it in the lunch box as dessert, or an after school snack or to end your day with a guiltless indulgence. It’s difficult to believe that these delicious muffins are vegan and loaded with a lot of healthy ingredients including oat bran. Preheat oven to 375F/190C for 15 minutes. Line required muffin tins with paper liners or grease it with a non stick cooking spray. 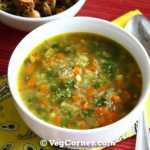 In a large bowl, stir together the dry ingredients and make a well in the center. Similarly combine together the wet ingredients in a separate bowl. Just stir it well with a whisk. Pour the wet mixture of the dry ingredients and stir until just combined. Do not over-mix. Bake in the preheated oven for 10 minutes for the mini muffins and around 16 minutes for the regular size muffins. The time mentioned in the original recipe was about 20 minutes, but when I did the toothpick test around 15 minutes I saw that the muffins were almost done, so just left it for one more minute. Leave the pan on the wire rack for just 5 minutes and transfer the muffins directly to the cooling rack. If the muffins are left in the pan for more than 5 minutes the muffins will start to condense. I just washed the carrot, apple and zucchini. Did not peel it before grating. Zucchini was not used in the original recipe, instead 2 apples were used and 1/2 cup skim milk. Since I used grated zucchini it started secreting water and so used only 1/4 of liquid (water in this case to make it vegan). So if you are using all apples, you may want to use another 1/4 cup of liquid or add less or more according to the consistency of the batter. Also 2 teaspoons of cinnamon was used. Since I’m not a cinnamon fan I used 1 teaspoon of cardamom instead and actually felt that even that was more. If you are not a spice fan like me even 1/2 teaspoon should be fine. Once the dry and wet ingredients are mixed together you may notice that the mixture is very tight unlike the usual muffin batter. Don’t worry though because the zucchini starts secreting water and makes it right. The mini muffin cups hold roughly about a tablespoon of the batter and fill the regular size muffin to the top of the tin. Since this muffin batter is thick it does not rise a whole lot, so you don’t have to worry about the muffins overflowing. The original recipe mentions that it will yield 18 regular size muffins. Since I wanted to pack it for my son’s lunch I first filled a 24 mini muffin tin and the rest of the batter was just enough for 9 regular muffins. Had I spooned the batter among the 9 muffin cups I would have got even beautiful muffins with bigger tops. has anyone tried reducing the sugar or substituting with jaggery or a healthier sweetener? Thanks so much for recipe and useful alternative instructions. Off to the shops now to get missing ingredients. I am going the apples, skim milk and cinnamon route (based on what I have and personal taste). 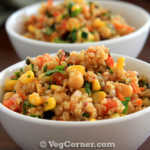 Don’t eat eggs or animals so this recipe is right up my alley. Will post later with my verdict. Since seeing this recipe about a week ago I had been dying to try it. The wait was finally over today and all I can say is wow. These muffins taste incredible, so moist and absolutely delicious. I have always wanted to do something with zucchini and now I’ve found it. Thanks so much for sharing. Swapped raisins for cranberries. Used coconut oil, 1/3 cup, no water. I baked in large Costco pumpkin pie pan for close to an hour at 350. My husband and I ate half of it in one sitting. The crispy, chewy top and edges are especially good. This is a keeper, delicious! That’s a great idea Mary. Madhuram, you are a goddess. Too often, eggless and Vegan baking can be less than impressive in taste and texture … not these wonderful gems! Just tasted my test muffin; a batch in the oven now. And so fragrant. I, too, am not a big cinnamon fan, so I used an over-generous measure of cardamom and freshly grated nutmeg. No zucchini, alas, so jiggered the grated apple. This excellent recipe seems tolerant to careful substitutions. Great recipe! My husband loves bran muffins but he has allergies to eggs. 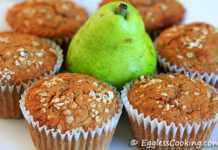 For years I would make him bran muffins without eggs but this recipe tast much better, I doubled the recipe and can tatse my flawed cooking (too much baking soda and powder. I will readjust the recipe next time. I love the fact that there is some fruit and veggies in them. Again thank you. You’re welcome Suzanne. Yes sometimes direct doubling of the recipe does not work. You have to make some tweaks here and there. I just want to thank you for this wonderful recipe. My 17 year old vegan daughter was having a really hard week and I wanted to make her something yummy, yet still healthy. I found your recipe and it was a huge hit. The rest of the (nonvegan) family likes them too. I have made them several times since and they always come out great. I keep the recipe the same except that I use whole wheat flour and coconut oil. I have made these twice now and I am addicted. Does it say anywhere the nutritional values? Llike calories, carbs, fiber etc. I’m taking them with me to a vegan program tonight. Thanks for this great recipe. You’re welcome Kat. I don’t have the information for this recipe but I’ll try to include it in the future. Thank you so much for this recipe! I was looking for something special but still healthy to make my daughter who has recently become a vegan and who has been having a difficult week. These muffins were perfect! We both thought they were super yummy. I followed the recipe just as written (except that I opted for 2 teaspoons of cinnamon rather than the cardamon) and they came out great. You’re welcome Rachel. Hope your daughter feels better. Hiya, I love this recipe and its worked fine the first time. However recently I can’t seem to get the mixture to work. It is always raw instead no matter how low or low long I cook them. Any suggestion? I love this recipe and wish to continue using it. Thank you for such wonderful recipes. That’s weird, Samantha. Excuse me for asking this, but are you preheating/baking it at the temperature mentioned in the recipe? Because I don’t understand why it wouldn’t bake otherwise. Plain flour, white flour and all-purpose flour are one and the same. So that’s ruled out. Do you think it’s moist or uncooked in the middle? Does it feel raw? If it’s just the wetness maybe you could try reducing the quantity of some of the liquid ingredients. Do you live in a high altitude place? Another thing you can try is to get an oven thermometer and check the oven temperature. Also do you have issues with any other baking recipes or is it just this one? You can use any pureed fruit/vegetable instead of the applesauce. Wonderful recipe ! The muffins came out perfect, thank you! Can I use 2 cups of oat bran in place of the flour? I want it to be flourless. Thanks! I’m not sure about it Kate. I guess you have to try it out for yourself. 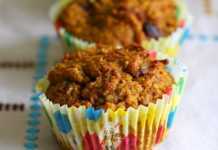 Really liked ur recipe.. Cuz I was looking for this eggless bran muffin :). Is it one number of carrot apple n zucchini or one cup..Of all three? And can we use wheat bran instead of oat bran if we want to? If yes then how much qty should be okay n is there anything else that we need to add to make it right? 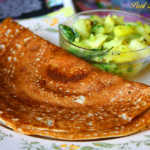 Pls let me know..
Pallavi I have updated the recipe. It is one cup of each or a medium size of each fruit/vegetable. I guess you could use wheat bran. I’m not sure because I haven’t tried. Also the texture of wheat bran is different from that of oat bran, so I’m not sure if it will affect the muffins. Other than that, you may want to add a couple of tablespoons of water to get the desired consistency of batter. It came out very well. A real treat to my son who is alergic to egg..
I’m discovering your amazing site! Thanks for share your delicated and lovely work. This is an incredible recipe! I can’t wait to try it. The cardamom’s option is perfect for me. I will make this especially for my five-year-old daughter. Welcome to my blog Patricia.